The name came about due to its coat, which is like cotton wool, and also from where it originated from, which was the seaport city of Tulear, now know as Toliara, and is located in Madascar. This little chap is related to the Maltese and Bechon Frise and is much alike in looks. The Coton is basically known as a new breed as it was only recognized by the FCI in 1976 and only since 1996 by the UKC, both listed the breed under Companion dog. The AKC ofically recognized this breed in 2014, under Non-Sporting Group. This breed is in danger of extinction in its native Madagascar. The residents of Madagascare are very proud of this little dog and featured a tri-coloured Coton de Tulear on a postage stamp that was issued in 1974. It seems as if this breed were bred solely as companions for people, however, there are stories that the breed first arrived in Madagascar several hundred years ago by ship, and in addition to being companions were used to hunt rats and mice on boats. Known to be very friendly, intelligent and easy going, learns very quickly and loves nothing more than pleasing his person. Many of this breed have the tendency of almost talking back to one, and are forever making a series of noises, such as grunts, whines and growls, which will just increase, if you talk back! This little dog is very adaptable and easy to live with. It does require exercise, as all dogs do, however a daily walk will take care of its needs. They do very well at agility and learning tricks. It does seem as if this little dog is everything one could ask for in a small breed dog - happy go lucky, friendly, loves people, other animals and children, however, due to its absolute love for its people, it does not cope with being alone and tends to develop separation anxiety. Due to this it is very important that the time is taken when the dog is a pup to teach it Alone Time, and to keep this going throughout it's life, so that this terrible condition does not develop. Research on the breed indicates that they can be hard to toilet train. On average the Coton does not tend to be aggressive to other dogs, however you must make sure that your dog has been well socialized so that it will accept another dog into the home. ​Do they get on with other dogs? ​ght with each otherOn average, yes they do get on with other dogs. 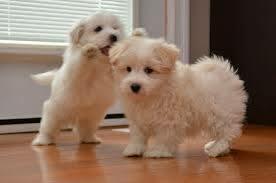 However it is always a good idea to attend puppy school and continue the socialization throughout the dogs life. Being such a small breed, care must be taken when playing with bigger breeds as it can get hurt. They do not seem to present any problems getting on with cats and smaller animals, however we do suggest that you habituate them to small animals when they are pups, as if they story that they were used for ratters on-board ships in the past, there could be a high prey drive, so rather be careful. Very, they love children, however given their small size, children have to be careful with them. It is a mistake to assume that all of this breed will like kids - ensure that early and continued socialization is done from being a pup with all ages and sizes of children. The health problems this breed tend to be prone to are allergies, ear infections, and hereditary eye diseases can cause blindness. They are also prone to bad hip joints and lameness as well as luxating patella. Heart disease is also listed as well as urinary stones and hypothyroidism.